Piper Jim MacRae was born in Grove City, Pennsylvania in 1944 to Alex MacRae, a foundryman and Frances Hall MacRae, a housewife. Jim’s piper/fiddler grandfather Sloan Murdock MacRae was born in 1879 in New Cumnock, Ayrshire, Scotland and immigrated to the US in 1910, settling in Western Pennsylvania where he was employed as a coal miner. Jim has his grandfather’s pipes, identified as being an 1890 vintage set made by Torquil MacLeod. He never heard his grandfather play but enjoyed his fiddle music. Jim’s grandmother, Elizabeth Lambie MacRae, was born 1879 in Barr, Ayrshire, Scotland and immigrated to the US in 1912. "Grandfather Sloan, who was instrumental in forming the Grove City Highland Band in late 1940’s, tried to get me started piping when I was a child but I was not interested at the time." Jim’s wife, Judie Dawes MacRae, also from Grove City, played snare drum for the Gary Kilty Band in late 1960s and early 1970s. She was also an open class Highland dancer. "Our older daughter played tenor drum with the Invermich Gaelic Society Pipe Band (Chicago) and went to Scotland with the band in 1987 and 1990. Our younger daughter, besides being an open class Highland dancer, learned to play the pipes in 1996. At the Chicago games that year she surprised me by playing for me while I was judging a contest there, but she has not kept up with it in recent years." Jim graduated from Grove City High School in 1961. He attended the Carnegie Institute of Technology in 1961-62 where he began his study of the pipes. He graduated from Grove City College in 1965 as Metallurgical Engineer, and received an MBA Degree from Olivet Nazarene University in 1996. A Freemason, Jim enjoys playing golf, and doing genealogy. Jim’s first piping teacher was Lew Davidson. Later, he studied with Harold Reed, PM of the Grove City Highland Band from 1962-1965, studying both band and solo music. "Harold had been taught by my grandfather," Jim explains, "and imparted many stories about his learning." In the mid to late 1970s, Jim continued his study with Gordon Speirs (Milwaukee) who was the primary influence on his piping. 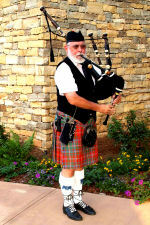 "From Gordon, I learned to play piobaireachd and developed my proficiency for both band playing and solo piping. For a time, I worked with Jim Imlach (Chicago) who helped me develop and improve my technique, especially regarding band playing." Over the years Jim attended various workshops and summer schools, such as the Ohio School of Scottish Arts where he studied with Ken Eller, Sandy Keith, and John Recknagel, the North American Academy of piping where he studied with Sandy Jones and Hammy Workman, and the Atlanta and Shreveport workshops where he continued to receive top class tuition. The first pipe band Jim played with was the Carnegie Tech Pipe Band in 1962. With them, he marched in his first parades playing only a few of their tunes, and struggling with his grandfather’s pipes that needed a new bag. The chanter was an old Stark and he could never really tune it to the rest of the band. Next, he played with the Grove City Highland Band and then the Stock Yard Kilty Band (Chicago). The latter association did not go well. "I was asked to turn in my uniform because of lack of interest, band spirit and playing ability." Jim went on to play with the Westchester Highlanders (Chesterton, IN), and later formed the Gary Kilty Band of Gary, Indiana and served as the band’s Pipe Major from 1967 thru 1973. The band was made up mostly of youngsters. "We participated in the Scottish World Festival in 1972, playing in the Grade 4 contest. I taught nearly all of the members. One of my players was Larry Samuels who currently plays in Grade 1 in San Diego, CA." In 1973, Jim co-founded with Terry McHugh the Invermich Gaelic Society/University of Chicago Pipe Band and remained with the band until 2000. He served most of those years as Pipe Sergeant and did most of tuning. Jim went to the World Pipe Band Championships in Scotland with the band in 1987, 1990, 1993 and 1999. The band advanced from Grade 4 in 1981 to Grade 2 in 1989, but then dropped back to and remained at the Grade 3 level until the band became inactive in 2001. When that happened, Jim and most of the other players decided to go to the Chicago Caledonian Pipe Band. "The day I got my kilt issued, I had to tell them that I was taking a job in Alabama and could not accept it." "In 1977, I founded the Orak (Shrine) Pipes and Drums, and I served as its pipe major until 1996. The band won the Mid Western Pipe Band Association’s Grade 5 Champion Supreme in 1985 and again in 1986. I played with the Atlanta Pipe Band briefly in 2001, and then the Birmingham Society of Piping, which changed its name to the Alabama Pipes and Drums in 2004. 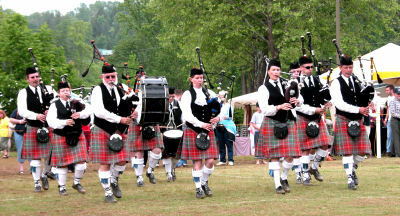 The band played in Grade 5 and won 1st place honours at the Gatlinburg Highland Games 2006. The APD was upgraded at the end of the 2006 season." Jim also played briefly with the City of Chattanooga Pipe Band in 2005. "I have enjoyed many aspects of my piping over the years. I am particularly proud that I progressed through the solo grades to Grade 1 in late 1990s, and served as an Associate Judge prior to moving to Alabama." Another memorable moment for Jim was when his band won the Best Overseas Pipe Band award at the World Championships in Glasgow in the early ‘90s. "Still another was when I had the opportunity to lead the Invermich Gaelic Society to 1st place at the Alma Highland Games in 1988." Although he did not have the time to get too involved in the various piping and pipe band organizations, Jim did serve on board of Mid Western Pipe Band Association in the late 1990s. "I enjoy teaching and have had numerous private students over the years. I published my own method for teaching, ‘The MacRae Tutor for the Great Highland Bagpipe’. I was recorded for an album called "Tinkers ‘n’ Rogues" by Denim &Lace, playing for the last cut of the album, a track called "Time to Come Home", which I later learned was the tune "For Ireland I Will Not Tell Her Name." I also recorded "Cha Till MacCrimmon" (translation: MacCrimmon Will Never Return) for the St. Louis PGA Senior Tour in 2004. The recording was also used for the 2005 Senior Tour in Birmingham, Alabama. Though I’ve had a number of interesting performance opportunities, the one that stands out most was a concert in Chelyabinsk, Russia on May 15, 2000. I was working as a Metallurgical Engineering Consultant at Mechel Steel in Chelyabinsk in early 2000. I would go over for about three weeks and then return home for about three weeks. I first went over at end of February and returned finally at end of June. Much of the time, the weather was rather cold and I needed an indoor place to practice. I arranged for the use of a "concert hall" - a remodelled church in the centre of town. In return, I agreed to do a concert for them. I put on about an hour's program playing and explaining about pipes and the uniform. I had a great translator and we basically worked out kind of a scripted program so she didn't have to do as much on the fly translating. I played traditional Scottish, Irish and American tunes as well as a couple of Russian tunes that went over extremely well. The audience sang along with them. It is interesting to note that on one of the walls was a sconce of a piper. One of the Russians videotaped the program and presented me with a copy. "Also while there, I went one weekend to a two-day music festival in the Ural Mountains. I was invited to open the day on Sunday morning with some pipe selections including the Russian tunes. "I also played for the "Orkney Wedding with Sunrise" with the Alabama Symphony, March 17- 18, 2006. The Orkney Wedding with Sunrise, if you know the arrangement by Peter Maxwell-Davies, is written as pipe music in the key of D.　The only problem was that that was key that the orchestra played in, while the pipes were normally a semitone different (i.e., in E-Flat). It was quite a challenge to get the pipes set up to play in that key. Fortunately one of my band members had done the piece previously and had a concert pitch A chanter. I also needed drone reed extenders to get them to tune to that pitch tune. There’s not much volume from the pipes with that set up, but it did go well. It would have been much better if they could have transposed and played it the normal key of the pipes." Jim has some excellent advice for young learners. "Nothing can replace serious practice that develops the skills necessary to become an accomplished piper," he says. "One-on-one instruction is the best way that I have found to develop piping either for myself or for my students. Things have changed a lot since I first started. When I began piping in the ‘60s the Grade 1 bands were about equivalent to the Grade 3 bands of today. "I think that you should be willing to help whenever you can. I enjoy working with enthusiastic players and bands. I have found wherever I have traveled in the world that I have met pipers and have always been warmly welcomed. It is surely a worldwide brotherhood."